How many different anti-coagulants are available for the treatment of thrombosis? 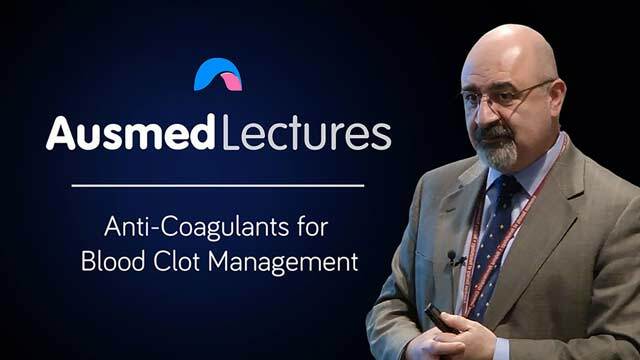 This short lecture from haematologist Dr Ali Bazargan provides an easy-to-understand guide to navigate the world of anti-coagulant acronyms. Come and explore what LMWH, VKA and NOAC stand for and how they act. Dr Bazargan is a Haematology Consultant at St Vincent’s Hospital. He has broad expertise across the field of benign and malignant haematology, with a special emphasis on clotting/bleeding disorders, lymphomas, myelodysplastic syndrome, myeloproliferative disorders and FBE abnormalities. Dr Bazargan obtained his MD degree in 1992 and carried out his basic & advanced physician and haematology training at Monash Medical Centre, St Vincent’s Hospital and Peter MacCallum Cancer Centre. He is actively involved in clinical trials in a wide range of haematological malignancies as principal investigator or associate investigator at St Vincent’s Public Hospital. As a member of the Haematology Society of Australia & New Zealand, American Society of Haematology, Australasian Leukaemia & Lymphoma Group and European Haematology Association, Dr Bazargan is committed to providing individualized clinical care for patients with blood disorders and is well known for his dedication and compassion in achieving the best possible outcome for his patients.